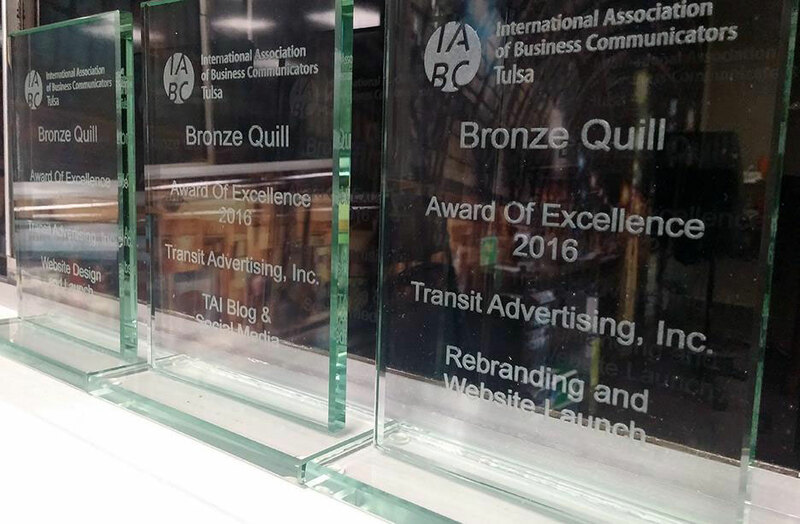 Transit Advertising, Inc. received three awards from the Tulsa International Association of Business Communicators 2016 Bronze Quill Awards on March 3. We were honored for our rebranding, website and social media efforts. Transit Advertising, Inc. came under new ownership in July 2015 and the company found itself without a brand identity, website or social presence. Owner Ryan Myers put together a team to rebrand the company. It was important to Ryan that Transit Advertising, Inc. was easy to find online and communicated what the company has to offer. Our team created a new logo, implemented consistent messaging and created a strong web presence in only six months. Tulsa’s IABC chapter launched the call for submissions in late 2015. Our team submitted three entrees for the company’s rebranding and website launch, blog and social media, and website design. Each submission was honored with an Award of Excellence, the highest award offered by local IABC chapters. IABC Bronze Quill Awards recognize outstanding employee communications, public relations, media relations, community relations, government affairs and marketing communication efforts. A panel of seasoned communications professionals judges each IABC Bronze Quill entry. Bronze Quill Award entries are scored using a seven-point global scale of excellence, also used in the Gold Quill Award and Silver Quill Award programs. Entries must receive a score of 5.75 or higher receive an Award of Excellence. We are proud of our team and excited to share the benefits of transit adverting with the communities we serve. Hey there … Perfect content and also very educative. Nice to discover your current website.